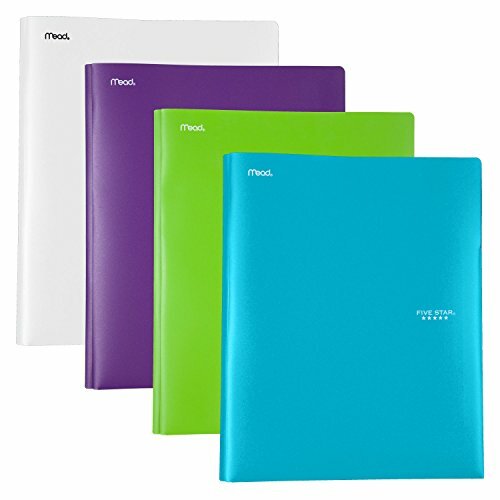 The Five Star plastic pocket and prong folder is the perfect way to keep track of your busy school life. The durable Poly construction is sturdy to help protect your important papers all year long. The 3 prongs hold hole punched papers neatly in place to help keep you organized. The two horizontal pockets can hold loose sheets, making it a great place to quickly stash notes, homework and more. Holds Letter size sheets. Overall size 9-3/8" x 12" x 1/8". Two horizontal pockets store loose notes and assignments. 4 pack includes: royal purple, lime, white, teal.